Packet Continuum is a powerful software architecture that offers lossless packet capture, fast query retrieval, IDS alerting and a real-time Log Manager. Packet Continuum is disrupting the market with open data access, smooth scale, and long timelines – at very low cost. Packet Continuum is an “Open PCAP Infrastructure” that can support even the largest enterprise-scale users. Lossless packet capture is the immutable ground truth of any critical event – not merely an interpretation. Enterprise users can “Free Your Data” – i.e. take direct ownership of your own critical network data resource. Packet Continuum is designed for massive scale via MapReduce distributed computing techniques. Cluster systems may be globally federated for unified search/retrieval, or locally aggregated for lossless capture in excess of 100+Gbps. 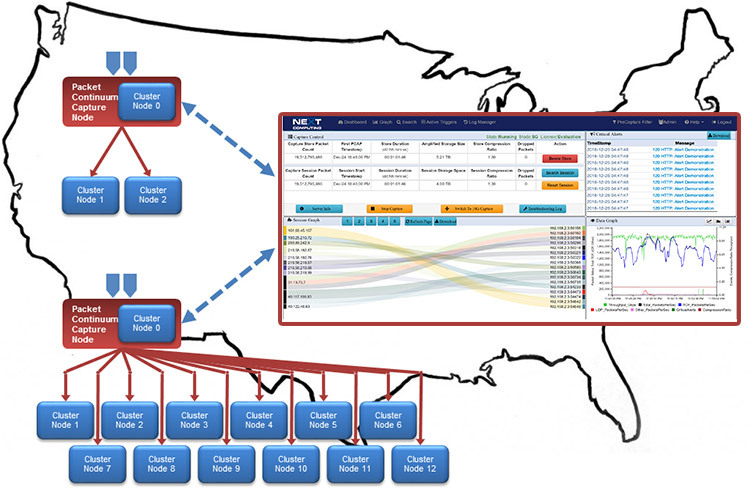 Packet Continuum dramatically lowers the cost of long, rapidly-searchable capture timelines. Cluster system flexibility lets you build the right solution for any size network application, targeting Cyber Security, IT Operations or Compliance. Packet Continuum software deploys on a variety of integrated appliances, including Portable, Deployable and Enterprise-scale. NextComputing Adds Critical Threat Intelligence Tools to its Cybersecurity Architecture, Packet Continuum (1/24/2018)- Packet Continuum v408.8 brings new features focused on helping you defend critical IPs and block threat IPs on your network. Secure Your Network with New Packet Continuum Features (7/18/2017)- NextComputing proudly announces a set of NEW features that further enable uncovering the immutable ground truth of any critical event, not merely an interpretation. Packet Continuum is compatible with third party commercial and open source tools providing you with a complete Cybersecurity protocol. Introducing The New and More Powerful Packet Continuum (2/8/2017)- Packet Continuum, the open, massively scalable packet capture software from NextComputing, now features new and enhanced functionality, making it an even more powerful solution for lossless packet capture.